I completed this Kalle shirt about a month ago, just before my trip to Europe. I’ve worn it quite a lot since then, pairing it with my favourite me-made culotte pants, self-drafted mini, or RTW jeans (RTW because I have yet to make my own jeans. It’s on the agenda :)). 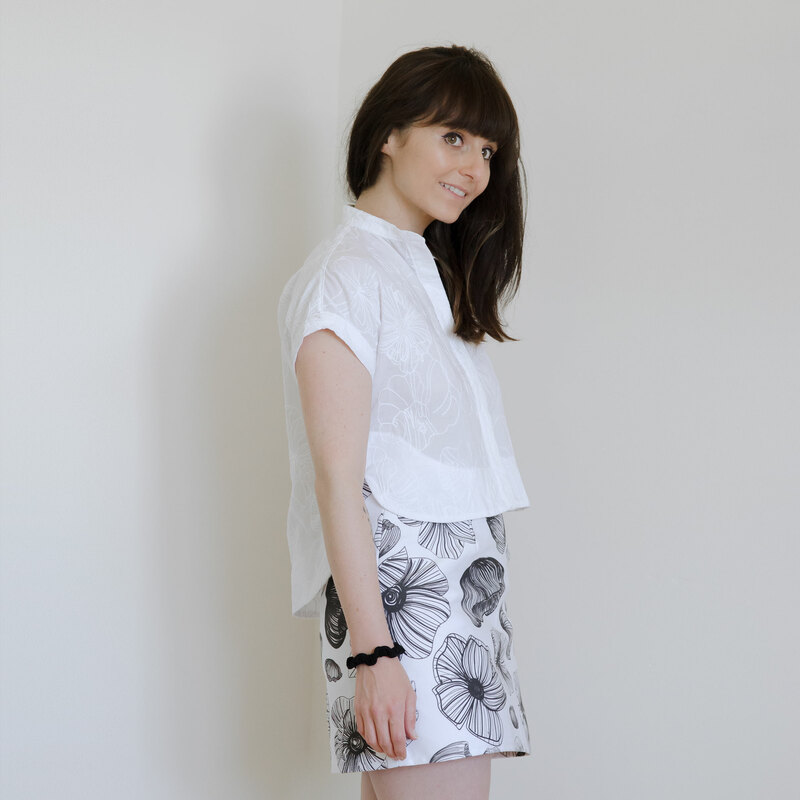 The Kalle Shirt + ShirtDress by Closet Case Patterns has lots of options to choose from. I decided to make “View A”, which is a cropped shirt with a band collar, hidden placket, and inverted pleat. Based on my bust measurement, I cut a size 2 and am happy with the way it turned out. I love its loose fit and beautiful curved hem. I also love how the Kalle shirt required me to tackle new techniques. Closet Case’s comprehensive and easy-to-follow instructions ensured it all went smoothly. The “burrito method” to sew the yoke is just magical and looks so neat. It was also my first time making a hidden placket. It gives a beautiful finish to the shirt and the few invisible hand stitches between the button openings ensures the placket remains closed. Originally, I had a different fabric in mind. But when I came upon this light white voile with floral embroideries, I was reminded of a recent fabric design of my own that I used to make a denim mini skirt. That design has line drawing flowers that are similar in size and style to the embroidered one on this cotton voile. I thought it might be nice to pair these two motifs, and so that is why I went with this fabric. I think it was the right choice!